The Allstar Link software needs to interface to the radio in order to control Push To Talk (PTT), recognize when a signal is present on the radio (COS) and also manage the TX & RX audio streams between the Raspberry Pi and the radio. 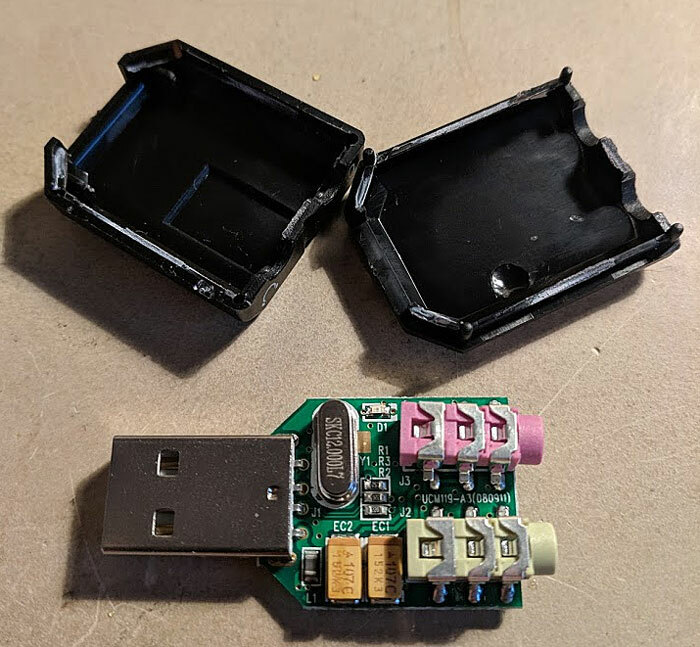 All of these functions are achieved using a USB sound card fob that plug into to the RPi’s USB connectors . The connections to the radio however require wired connections. 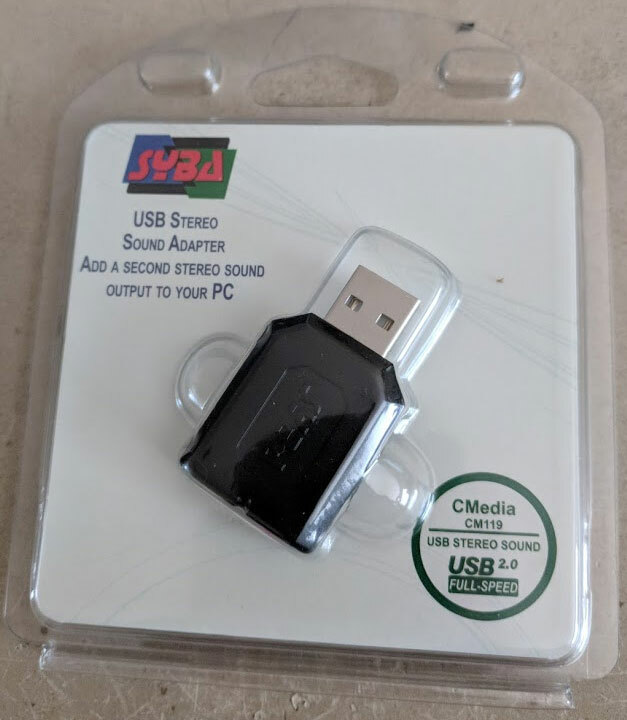 The sound USB card fob I used, like the radio has undergone some revisions since others published their modifications. I found this fob on Amazon for a few bucks. As you might expect the RX & TX audio are already part of the sound card as this is the intended function of a sound card. RX audio goes to the Microphone input and the TX audio comes from the sound output (In the case of Allstar we only use the Left channel output). 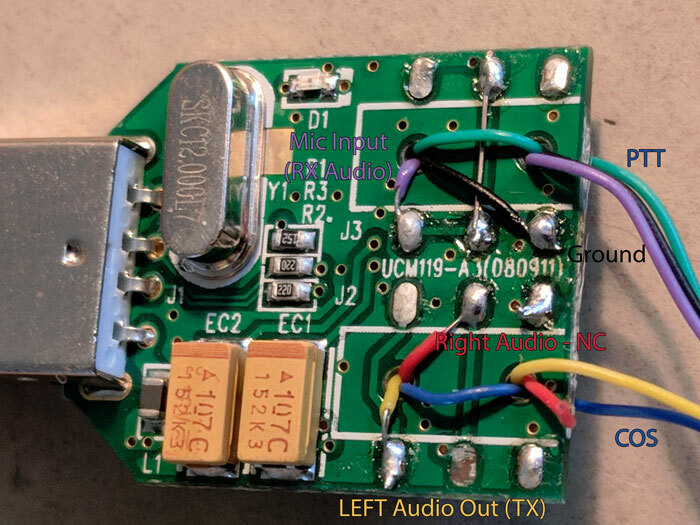 The sound card chip inside the fob has some extra GPIO abilities that we need to tap into for PTT (Push to talk) signaling and COS (COS – “Carrier Operated Signal”, “Carrier Operated Squelch” or “Carrier Operated Switch” or COR Carrier Operated Relay… all the same thing, just different names). Between the fob and the radio some simple addition circuitry is needed which will be explained in the next article (Link) . 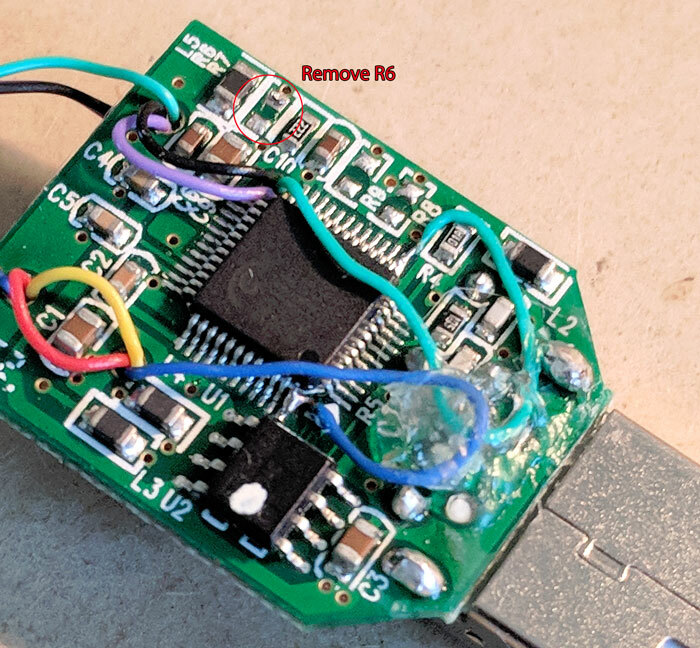 The remainder of this article will explain how to wire up the sound card fob in preparation for the final connections. The first step is to pry apart the black case. I used a small flat blade screwdriver inserted into the seam between the two halves of the case and pried the case apart. I decided to remove the mic and speaker connectors from the board. I am not sure if I would do this again because the board was very easily damaged by de-soldering these connectors. Fortunately, I only damaged pads on the board that were not needed. It should be possible to just solder to the existing pads with the connector left in place. 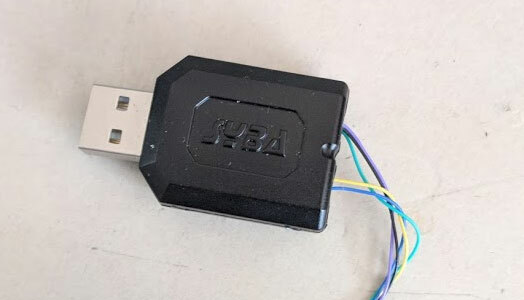 If you are careful and brave, and you do decide to de-solder the connectors, it does expose some holes in the PCB which are useful for wire routing and strain relief. The first two connections to make are for the PTT and COS lines directly to the sound chip on the board. 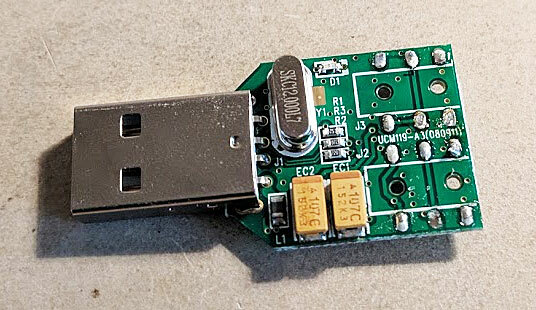 The sound chip has GPIO pins that are not used in this FOB but are accessed by the Allstar software. So we connect wires to these two pins. 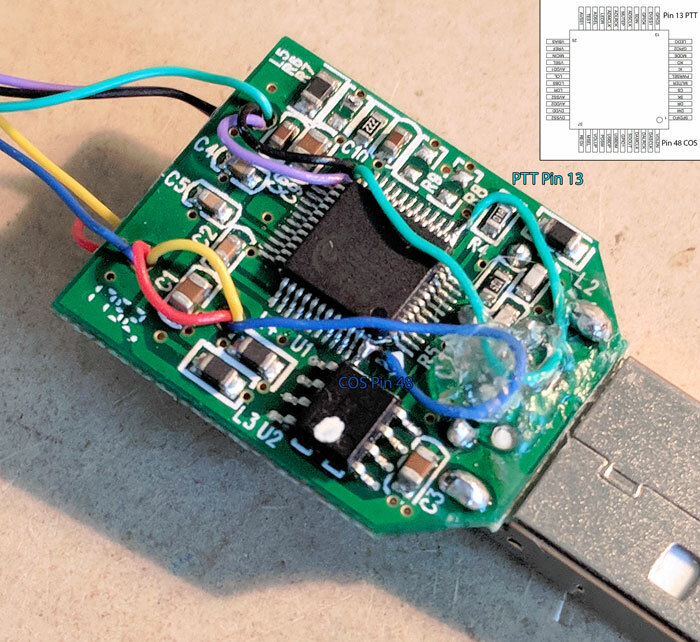 In the picture above, I have included a pin-out diagram oriented in the same way as the image so you can clearly identify the PTT and COS pins . To make these connections, I used 30 awg wire-wrap wire. (Any small gauge will work) I tinned the stripped end and quickly touched the soldering iron to the pin and wire to make the connection. The blue wire is the COS line, connected to pin 48 of the chip. The green wire is the PTT line and is connected in the same way to pin 13 on the chip. These connections are very delicate so add strain relief with a dab of silicone or similar. The remaining connections are made to the audio jack pins as shown. One more thing – Resistance is futile. Computer based sound cards expect an Electret microphone that require power to be run to the microphone over the mic wire. Our connection to the BF888s does not expect this, so we have to remove this power source from the mic line. This is easily done by removing resistor R6 from the board. Touch the tip of your soldering iron to one side of R6 and pry gently up. Work on both sides and the resistor will come off without too much effort. I ran the wires though the holes left behind from removing the jacks for strain relief. I put the board back into its case and ran the wires through the holes left behind in the case. Tip: Leave the wires long, they will be cut to size in the next step. Next up the interface board and final assembly.